MEXICO CITY, Mexico, September 23, 2013 (ENS) – Two hurricanes which struck Mexico last week have claimed the lives of 115 people as rescuers continue to search for 68 others believed to have died in a massive landslide in a remote coffee-growing village. A 16-person emergency response and rescue team from the Mexican army is leading the search for victims of the slide in the village of La Pintada two hours drive north of Acapulco. Five bodies were found on Sunday. Hurricanes Ingrid and Manuel made landfall on opposite coasts within a day of each other last week, damaging at least 35,000 homes. After visiting the rescue operation in La Pintada, Mexico’s President Enrique Peña Nieto said it is likely that more than 60 people died in the slide. He promised the village would be rebuilt. President Peña said that Civil Protection centers across the country are now on alert; he said the recent rains have been the most intense in Mexico’s history. The first of the two storms to strike, Hurricane Manuel brought widespread flooding across much of Mexico. The thirteenth named storm and seventh hurricane in the Eastern Pacific this year, Manuel originated from a strong area of low pressure south of Acapulco on September 13. As a Tropical Storm, Manuel first made landfall near Manzanillo on the Pacific Ocean, where Mexico’s busiest port that handles cargo for the Mexico City area is located. Its center dissipated over western Mexico on September 16 due to interaction with land. The storm’s remnants tracked northwestward into the Gulf of California, where they reorganized into a tropical cyclone the next day, still considered a continuation of Manuel. Manuel regained tropical storm status on September 18 and began to curve to the northeast. Manuel then attained hurricane intensity for the first time, before making its final landfall just west of Culiacan at peak intensity as a Category 1 hurricane. Over land, Manuel then weakened due to Mexico’s mountainous terrain, and dispersed early on September 20. Tropical Depression Ten formed in the southwest Gulf of Mexico on September 12 and strengthened into Tropical Storm Ingrid less than 24 hours later. Moving across the southwest Gulf of Mexico, Ingrid intensified to become the second hurricane of the 2013 season on September 14. Ingrid weakened to a tropical storm as it made landfall near La Pesca – 25 years to the day after Hurricane Gilbert hit La Pesca on September 16, 1988. The storm broke up over the mountains of eastern Mexico the following day, just as Tropical Storm Manuel was striking Mexico’s Pacific coast in a rare double whammy. 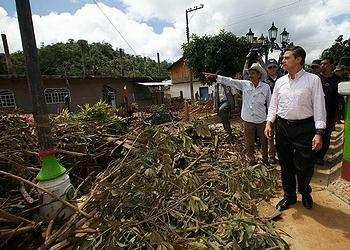 President Peña said than one million people across the country have been affected by the storms, and 50,000 were forced to evacuate their homes. The storms washed out roads and bridges, toppled trees and caused power outages. Emergency declarations have been issued by 144 municipalities and five states – Tamaulipas, Colima, Veracruz, Oaxaca and Guerrero. In addition to flooding, the historic rainfall has caused major damage to infrastructure in many areas. The major highway Autopista del Sol is closed due to landslides, many federal bridges have collapsed and dams in the country are pouring water. At least 40,000 tourists in Acapulco were stranded after the airport terminal was flooded. 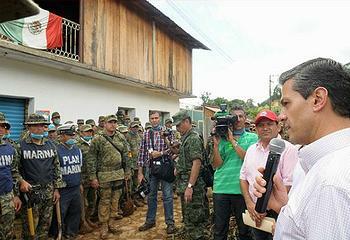 Angel Aguirre, governor of the hard-hit state of Guerrero, said floodwaters destroyed hotels and stores in Acapulco, where looters took over, ransacking shops for valuables. A state of emergency was declared for Acapulco, and some 12,000 items of aid were airlifted to the region. In response to Hurricanes Manuel and Ingrid, the U.S. government, through USAID’s Office of Foreign Disaster Assistance, is providing $250,000 to immediately aid communities devastated by the storms. The donation to the Mexican Red Cross will be used to deliver emergency relief supplies to those populations most affected, with a focus on the State of Guerrero.